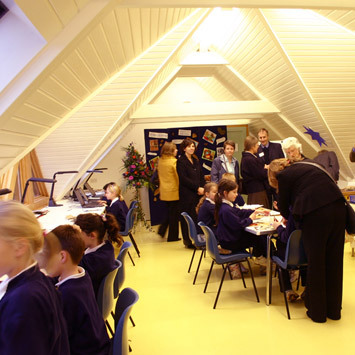 The College wished to replace some old asbestos garages with an art studio, for use by groups of children and adults for art courses. The new art studio is located next to St Marks College, a grade I listed 17th century building which is a residential youth and conference centre. 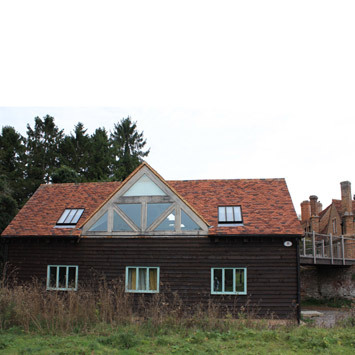 The new art studio was designed as an ecological and affordable timber-framed structure, with the art studio located on the first floor, making the most of the lofty pitched ceilings with the trusses exposed. We incorporated a gabled roof front and back, which echoed the gables of the college, and inserted into these large glazed oak openings which provide ample natural light into the space. The building is lower than the college, which allowed a bridge over from the croquet lawn into the art studio, making it easily accessible. 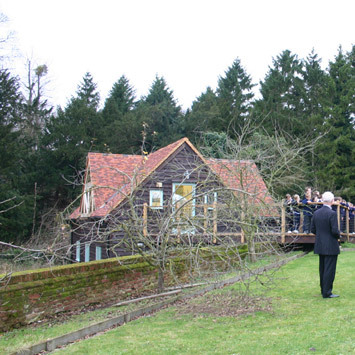 The lower floor contains the kiln, store, the canoes and bikes which are used by the children for activities. The studio is available for hire.